Voot, Viacom18's Web channel, has featured successful shows like It's Not That Simple, Untag etc, ever since it came into existence. Cashing on the lucrative digital medium, Voot is already giving stiff competition to its counterparts like Ekta Kapoor's ALTBalaji, TVF, AIB and many others. 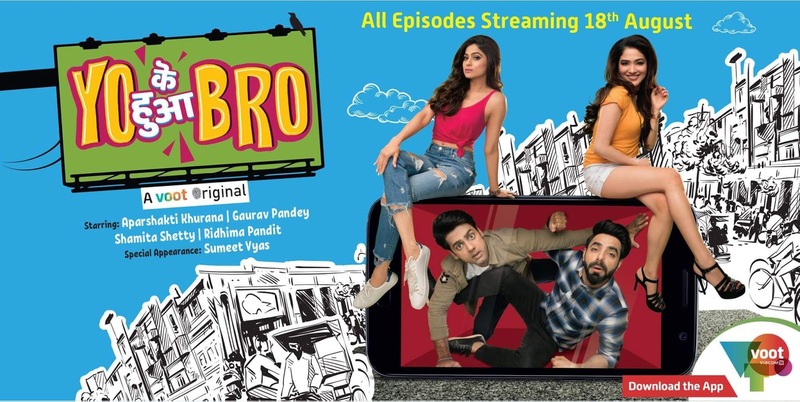 'Yo Ke Hua Bro' is an upcoming Web Series on Voot Channel.The series will be a 6-episode original series which stars Shamita Shetty, Aparshakti Khurana, Gaurav Pandey and Ridhima Pandit. 2 desi dost, 2 divas and an epic kaand that hits Voot on August 18! Mahendar Gahlawat and Piyush Sharma, have tried forever to find their dream girls. But when two drop dead gorgeous divas enter their lives, what ensues is a 'kaand' of epic proportions! Amidst the bromance, the romance and the hilarious twists, all our desi Dumb and Dumber duo can say is - 'Yo Ke Hua Bro?'! Recently she won the Dadasaheb Phalke Awards (Best TV Debut) for her debut Life ok show ‘Bahu Humari Rajni Kant’.Ridhima Pandit will playing the role of an innocent small town girl, but her character will have many shades. She will be starring opposite Aparshakti in the web-series.